Welcome to this week’s Wednesday Words. 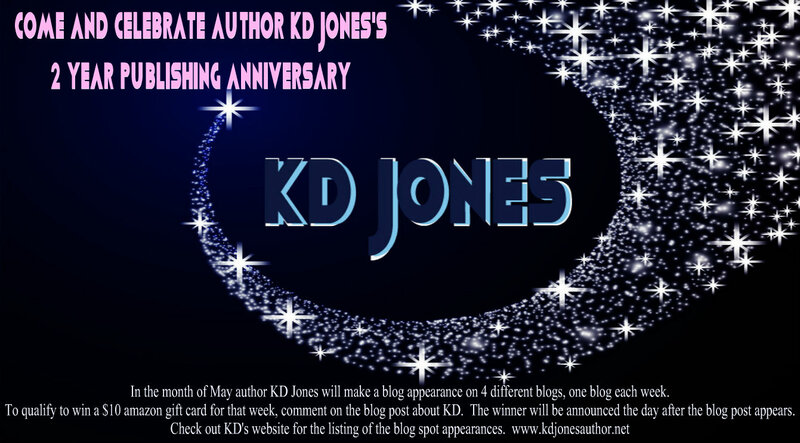 Today we have with us sci-fi author, KD Jones, on the last stop of her blog hop celebrating her Two Year Anniversary as a published author and the release of her latest book – Kiljorn Commander. KD is giving away a $10 Amazon Gift Card to one lucky visitor to leave an answer to the question. The contest question will be hidden in the blog post so read carefully and good luck! Warning: For Mature Adult Audiences. Contains language and actions some may deem offensive. MF. In book eight of Katieran Prime: Commander TylOR of the Kiljorn nation has a mission to guard the wormhole from enemies of old and new enemies within. He shares this mission with the half-brother who he only recently met. The two brothers don’t get along. To make matters worse, the one female who has plagued him since he first met her is going to be traveling with him. His brother tortures him with constantly flirting with the female. TylOR fights his inner battle to claim the female. If he doesn’t soon encounter an enemy he can kill, he might have to take out his brother while waiting. Dr. Elizabeth “Lizzie” Connell has a PhD in linguistics, a doctorate in social cultures, and a doctorate in foreign languages. She has traveled all over Earth learning new cultures and experiencing the thrill of living on the edge. When she travels to Katiera she thinks it will be the pentacle of her academic career. Lizzie gets a lot more education than she had anticipated. First, she is almost captured by the Katieran’s long time enemy, the Morins, only to be sort of rescued by the most egotistical, yet attractive man she has ever met. One she finds she has a hard time ignoring. Lizzie survives one battle from the Morins, only to find herself fighting an internal battle of wills that she fears has an inevitable outcome. TylOR and Lizzie have fought their attraction for one another from the very beginning. They have tried to ignore each other but circumstances change forcing them to be in close proximity of one another. They must face their feelings for one another while handling the dangers they are thrown in. Will they survive long enough to see their relationship through? Will the enemy end them before they can start? Come follow the journey as both TylOR and Lizzie discover there are some things you just can’t fight and some worth fighting for. How many books does KD Jones have published? **To enter the contest please leave your answer in a comment and check KD’s blog on Thursday to find out the winner of the $10 Amazon Gift Card. Good luck! Once again I want to thank KD Jones for visiting with us today. Don’t forget to enter the contest for a chance to win the $10 Amazon gift card.. Good luck everyone and Congratulations and Happy Anniversary KD! Congratulations. I only find fifteen books both for sale on amazon and on your web page. Congratulations on your two year anniversary. Awesome 18 books! congrats and happy anniversary. and thanks for the giveaway. Congrats KD! 18 books in 2 years – how many words do you have left in you? Since there was confusion over how many books I published, I entered everyone into a random.org randomizer. There are two winners for this last Blog contest. Hearther and Maria will both receive a $10.00 amazon gift card. Thank you so much everyone for participating and a big thanks to Lynne St. James for hosting my giveaway! Congratulations, KD!! You have written 18 fabulous books! First of all congratulations KD with your 2 year anniversary and your newest book release! The answer is 18 books. Maria you and Heather both won a $10.00 amazon gift card. Since there was debate over the number of books I entered everyone in a random.org randomizer and picked 2 winners. Please email me with your email address so that I can send you your gift card.